It’s not surprising that healthcare is at the top of many Americans’ concerns and at the center of an intense political debate in our nation’s Capitol. The current battle over cost and access, however, does not ultimately address the root of the problem: we have a disease-care system, not a healthcare system. 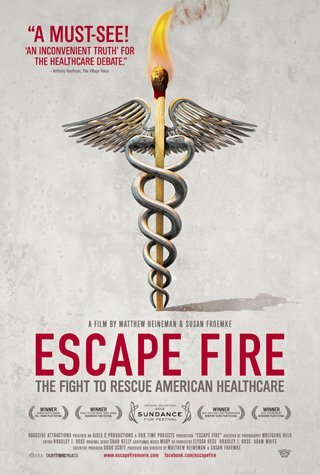 The film examines the powerful forces maintaining the status quo, a medical industry designed for quick fixes rather than prevention, for profit-driven care rather than patient-driven care. ESCAPE FIRE also presents attainable solutions. After decades of resistance, a movement to bring innovative high-touch, low-cost methods of prevention and healing into our high-tech, costly system is finally gaining ground. Director/Producers Matthew Heineman and Susan Froemke interweave dramatic personal arcs of patients and physicians with the stories of leaders battling to transform healthcare at the highest levels of medicine, industry, government, and even the U.S. military. ESCAPE FIRE is about finding a way out of our current crisis. It’s a primer on how to save the health of a nation.